David Krut Projects is very pleased to introduce their latest collaboration with Robyn Penn. 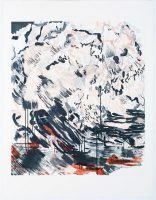 The Map is not the Territory Series is comprised of three prints made during a collaboration between the artist and David Krut Workshop in 2016 and have since reached international acclaim. 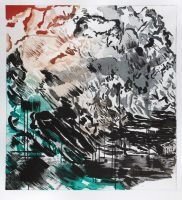 The works are printed from two large plates, which were made as a combination of sugarlift aquatint and hardground etching. Three variations of the prints will be exhibited for the first time alongside working drawings, process prints and other notes, giving the viewer an inside look into exactly what it takes to make works of such an epic nature. The Map is not the Territory is at once a cloud, a map, a landscape, the ocean and simply a series of marks on a page. The work references Penn’s politicized fascination with clouds as symbols for global warming and grapples with philosophical ideas about subjective experience. 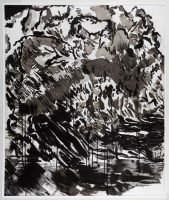 The title of the work references scholar Alfred Korzybski statement that “a map is not the territory it represents, but if correct, it has a similar structure to the territory, which accounts for its usefulness.” By depicting dripping, dream-like cloud formations, Penn engages the notion of reality as warped by human subjectivity. This ties into the manipulative strategies used to bolster the discourse of climate change denial, which the artist is exposing. The artist and printmakers will be available on the day to answer questions and talk about the work and collaborative experience. The printmakers will do a demonstration of the main etching technique used to create the prints – sugarlift. Each print is an edition of 6 Main collaborators: Master Printer Jillian Ross and Kim-Lee Loggenberg For more works by Robyn Penn, view our website here.